From her hypnotic vocals, to her melodic lyrics, to her commanding stage presence, Eowyn is one independent artist you won't forget. Though truly called an "independent artist" it is hard to see her as such with the amount of industry success she has already had. In the past year this artist makes it difficult for you to see her as anything but a proven national artist. Eowyn's radio success is just the beginning. 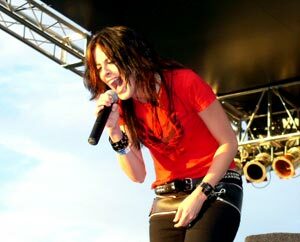 She has had radio play in over 200 cities and has had two Top Twenty National Christian rock singles on the R&R charts. Her first single "Take Me Away" ranked at number #18 and her second single "Hold Me" went up to #15. Eowyn has also had extensive touring experience playing in numerous small and large venues including festivals, bars, youth gatherings and arenas. She has shared the stage with some of the biggest artists in the Christian industry including Krystal Meyers, Petra, Staple, Tait and others. She has toured throughout the U.S from California to Florida showing no signs of stopping. With two full-length albums under her belt and a third album in the works Eowyn continues to amaze her listeners with honest lyrics and hard hitting vocals. Nashville's Embassy Music took notice of this and awarded her Grand Prize winning songwriter for her song "Break Free." She also caught the attention of some of the top producers in the industry including veterans Kevan Cyka (Lifehouse, R.E.M., Hillary Duff), Dan Needham (Stacie Orrico, Steven Curtis Chapman) and Matt Bronleewee (Plum, Joy Williams). Despite any success or setbacks Eowyn has encountered, this independent artist continues to push toward her ultimate goal of reaching both the lost and the saved. Her passion for sharing the love of God is evident in each and every performance. Eowyn sums it up best in her online journal when writing "I may be an independent artist, but I am not independent from God."